Open Enrollment for 2017 coverage with a Covered California Health Plan ends on Tuesday, January 31, 2017. 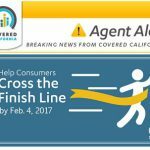 Covered California is allowing consumers who attempted to enroll by January 31 an extra four days to complete enrollment and select their health plan. Some consumers may face challenges completing enrollment and Covered California is committed to helping all consumers who attempted to find help cross the enrollment finish line. Covered California has released instructions for navigating the Special Enrollment Periods consumers are eligible for when they have a qualifying event. It’s important that the online application be filled out a certain way for different qualifying events. As Covered California began to allow consumers to renew their health insurance for 2016 the online enrollment system has ceased to operate. They issued an Agent Alert on Thursday at 2:45pm. More cuts to health agent commissions, can independents survive?